We recently had the honour of working with Dr. Kris Wells and his team at the University of Alberta on the 10th Anniversary Gala Wine Tasting and Silent Auction, a fundraising event that supports Camp fYrefly and the new fYrefly in Schools Program. 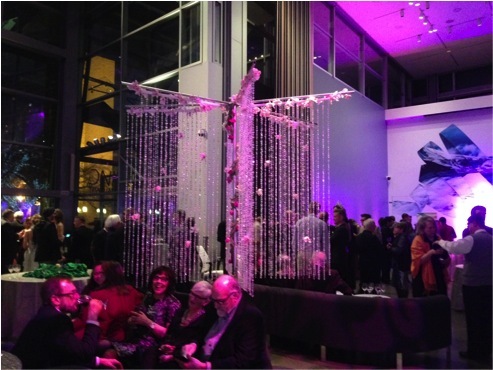 This dazzling event was held at the Art Gallery of Alberta with over 65 items donated for the cause and the highest record of attendance to date – congratulations fYrefly! Diamonds and bling were the look of the evening, with many guests sparkling in their finest sequined attire. We tied the theme together with silver sequin linens and a nine foot tall décor tree designed with floral accents and cascading shimmering beads. 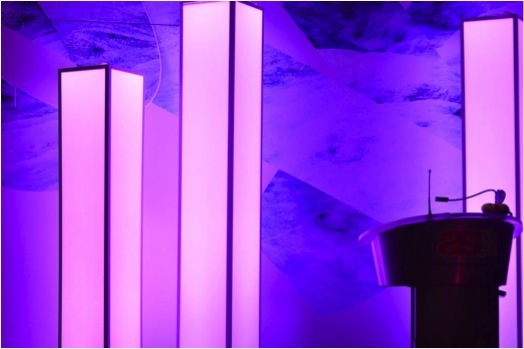 Diamond structures highlighted the stage and purple lighting gave the room an additional vibrant glow.